The following comments are meant to be representative, not exhaustive. Typical, really: Indian and Chinese people do the actual work, and the white guy who likely didn’t gets all the credit. Once again [the] simple attribution to John Napier is exactly that, simplistic and historically misleading. We can find the principle on which logarithms are based in the work of several earlier mathematicians. We can find forms of proto-logarithms in both Babylonian and Indian mathematics and also in the system that Archimedes invented to describe very large numbers. In the fifteenth century Triparty, of the French mathematician Nicolas Chuquet we find the comparison between the arithmetical and geometrical progressions that underlay the concept of logarithms but if Chuquet ever took the next step is not clear. In the sixteenth century the German mathematician Michael Stifel studied the same comparison of progressions in his Arithmetica integra and did take the next step outlining the principle of logarithms but doesn’t seem to have developed the idea further. It was in fact John Napier who took the final step and published the first set of logarithmic tables in his book Mirifici Logarithmorum Canonis Descriptio in 1614. However the Swiss clockmaker and mathematician, Jost Bürgi developed logarithms independently of Napier during the same period although his book of tables, Arithmetische und Geometrische Progress Tabulen, was first published in 1620. The “calculus” line is a mess. For starters, in at least one version circulating online, it’s got an extra “=” thrown in, which makes the whole thing gibberish. The $df$ over $dt$ notation is due to Leibniz, but the list attributes it to Newton, his bitter enemy (and a pretty bitter guy overall, by many accounts). Pierre de Fermat understood quite a bit of the subject before Newton worked on it, getting as far as computing the maxima and minima of curves by finding where their tangent lines are horizontal. And the philosophy of setting up the subject of calculus using limits is really a nineteenth-century approach to its foundations. Inverse-square gravity was considered before Newton, and imaginary numbers before Euler. Credit for the normal distribution should also go to de Moivre (earlier than Gauss) and Laplace (contemporaneous). 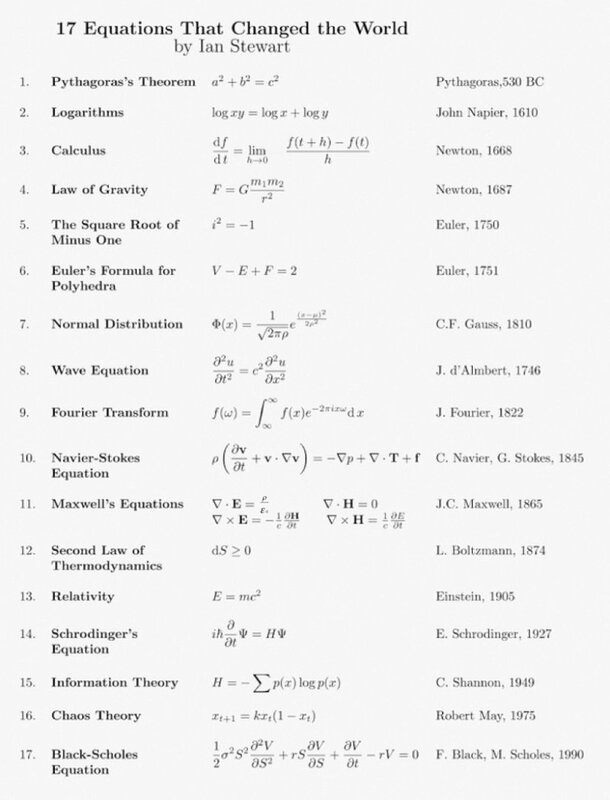 Maxwell never wrote his Equations in that manner; that came later, with Heaviside, Gibbs, Hertz and vector calculus. The simplification provided by the vector calculus is really nothing short of astonishing. Plucking out the Schrödinger equation (the list omits the umlaut because careless) does a disservice to the history of quantum mechanics. There are ways of doing quantum physics without invoking the Schrödinger equation: Heisenberg’s matrix mechanics, the Dirac–Feynman path integral, and the one it’s my day job to work on. In fact, not only did Heisenberg’s formulation come first, but we didn’t know what Schrödinger’s work meant until Max Born clarified that the square of the size of Schrödinger’s complex number $\Psi$ is a probability. The number of names in that last paragraph—and I wasn’t even trying—is a clue that factoids and bullet points are not a good way of learning physics. How are these various cycles arranged along the interval of relevant parameter values? This question has to my knowledge been answered independently by at least 6 groups of people, who have seen the problem in the context of combinatorial theory, numerical analysis, population biology, and dynamical systems theory (broadly defined).